Meeting Harry Lyon in the early 1980s was like a dream come true. It had been a chance encounter with the man for whom the title “legend” would be an understatement for me. My father had continued to live in the south of Wigan, then rugby league territory, so the pubs around us were steeped in that kind of nostalgia. One of those was ‘The Waterwheel’, run by ex-Great Britain rugby player, John Stopford. Although he never played for Wigan RLFC, Stopford would draw rugby enthusiasts to his pub. We mostly avoided such places, preferring to walk further afield to pubs that were more salubrious for Wigan Athletic supporters. But one rainy night we succumbed, and tried ‘The Waterwheel’. Upon opening the door and the sight of the scrum surrounding the bar we started to think twice about it. There were some burly men there, faces like boxers, some with arms in slings. We were just about to walk out when my father said “Look it’s Harry Lyon over there.” It was indeed my hero from my teenage years. Chatting with Harry was easy. He just made you feel comfortable talking with him. Although he had left the club a decade before it was obvious that Wigan Athletic was his first love. He remains the club’s leading scorer of all time, with 243 goals to his credit. Harry’s quote was straight from the heart, but the reality was that a 3,000 crowd was not the norm at the time. True, Latics had the best home attendances in the Cheshire League and their traveling support would so often ensure that clubs like Oswestry and Stalybridge would get their best crowds of the season. But for clubs at that level of English football it was a hand to mouth existence, but somehow most clubs survived. Gate receipts were the main source of revenue, which gave Latics an advantage, given their stronger support. But the reality was that most of the time the attendances were not a lot above the 2,000 mark. The club survived through the efforts of the Supporters Club and the Board of Directors dipping into their pockets. Financial survival has never been easy for Latics. In their inaugural season in the Football League, 1978-79, they averaged a healthy 6,701. The club’s attendances the season before, their final one in the Northern Premier League, had dropped to an alarming 1,334. The move up clearly had a major impact upon the town. Since then Latics’ highest average league attendance was 20,160 in their first season in the Premier League. Ironically their second highest was 19,345 in the relegation season of 2012-13. But the gloss was to wear off and Latics slumped to their lowest attendance levels of their Football League era with just 1,748 in 1994-95. If it had not been for the arrival of Dave Whelan in 1995 where would Wigan Athletic have been now? Attendances had been woefully inadequate and the club was sinking into a seemingly inexorable financial quagmire. But ten years later Latics were playing in the Premier League against Chelsea and a crowd of 23,575 was present despite the game being broadcast. It was a taste of things to come as the club’s attendances eclipsed those of the local rugby club that season and have done ever since, even last season despite relegation to the Championship. Latics’ gate money in the Premier League days was always dwarfed by the TV revenues they were receiving and from a purely financial viewpoint attendances were not much of an issue. In their last season in the Premier League match day revenues covered no more than 10% of total revenue of £56.4m. Without the television revenues, the club could never have seriously competed for eight long seasons in the elite division. 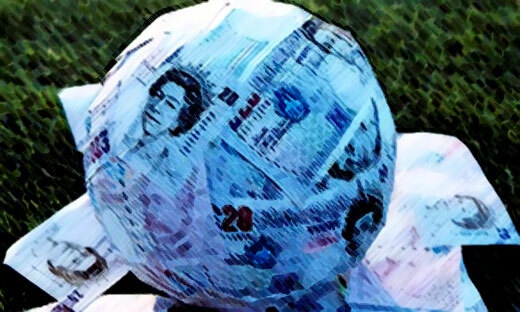 In my article Finances, FFP and the long term future of Wigan Athletic, published in May 2014, I put forward figures needed to stay afloat in the Championship. To keep a team in mid-table would typically involve a wage bill in excess of £20 million. Whereas to get into the top six would cost around £30 million, which is precisely what it cost Latics last season. With a significant drop in parachute payments to be received this season it looked likely that the club would start to trim its wage bill. The departures of ex-Premier League players Jean Beausejour, Jordi Gomez and James McArthur must have helped. However, manager Uwe Rosler was to bring in nine new players over the summer. Although some were younger players, probably not on relatively high earning contracts, the competition in the transfer market forced the club to offer more tempting salaries to the rest. The result was a squad that was larger than the club needed with a wage bill close to that £30 million of last year. Dave Whelan clearly had promotion within his sights when he released some £8-9 million in transfer fees for Oriol Riera, Andy Delort, Emyr Huws and Adam Forshaw. Much of the outlay was covered by the fee received from Crystal Palace for James McArthur, but their arrivals put more pressure on the wage bill. It was a gamble which was to fail, but Whelan is the shrewdest of businessmen and he knows if you don’t take risks you are likely to stand still. Huws was constantly bothered by an ankle injury and never reached top form, despite having moments of showing his true potential. He remains one for the future, despite being sidelined for the rest of the season with another ankle injury. Sadly Delort and Riera have been dispatched to their home countries on loan and Forshaw has been sold cut-price to Middlesbrough. Whelan had made the gamble, backing a manager who had performed admirably in the previous season. After being criticised by fans for hoarding the cash from the James McCarthy transfer the season before he had stuck his neck out in allowing Rosler to bring in so many players and run the risk of expenses heavily outweighing revenue. Following the departure of Rosler and the continuing downturn in results under Malky Mackay, the club made huge strides in getting its financial situation back on an even keel during the month of January. Just a few months before no one could have anticipated the fire sale that was to occur. Ten players were to leave, four of whom were members of the team that won the FA Cup Final. That famous cup final man of the match, Callum McManaman, went to West Bromwich Albion for around £4.5 million. Putting back the clock, what might have happened if he had not injured his ankle in the Arsenal match that followed the Cup Final and put Latics down? Following his Wembley display he could well have gone to a big club for some £15 million, if he had been fit. Sadly it did not happen and the ankle injury had a major impact on his fitness the next season. The rest is history. Such a fire sale would have brought huge protests from the fans under normal circumstances. But the “hatchet man” Mackay was able to do it with hardly a whimper from supporters who were thoroughly disillusioned with the lack of commitment shown by players whom many viewed as overpaid and overrated. The fire sale has put Latics back on track financially. Apart from the transfer fees received they have cut the wage bill down significantly, to probably around £20 million on an annual basis. Mackay paid transfer fees for two players – Billy Mackay and Jason Pearce – but the outlay for the two was less than £1 million. The rest of his acquisitions are loanees or players on short term contracts. For the coming season – no matter what division they are in – Latics will receive £8 million in parachute payments, plus around £2.5 million from TV money. The rest will need to come from gate receipts and commercial revenue. The latter has not been a major factor over these years, so gate revenue becomes increasingly important. Should they stay in the Championship, crowds of around 12,000 would most likely be the order of the day. That is providing a squad that will cost considerably less to maintain than those of the past two seasons can hold its own. Relegation would almost certainly mean a decrease in attendances, even if the team were to do well. Revenue from the visiting support would most likely nosedive. Gate money will clearly play a more major role for Latics next year than it has for more than a decade. Put simply it is going to be a more proportionate part of revenue than it has been. But then again, for Latics gate money does not correlate with attendance in the same way that it does for most clubs. The club had wisely kept admission prices relatively low during its most successful years and they remain so. It helped them compete for support within the town and build up a level of hard-core support that the club had never previously enjoyed. However, continuing the policy is not necessarily the right ploy for the club. At some time in the future it is going to have to start moving its prices more in line with that of its competitors, at the risk of losing some support. For the coming season the revenue and spending numbers need to add up. A £20 million wage bill is out of the question. Austerity will be the order of the day, no matter which division the club is in. However, the good news is that the club has become a model for others to follow in its financial management, which serves to safeguard its long term future. A profit of £2.6 million was announced for the 2013-14 season, following two previous campaigns in the black. The big question regarding revenue streams is whether Latics will be able to afford to run the Charnock Richard facility, assuming it will be completed. If it dies a death it will be much harder for Latics to put in place an Academy that providesthe first team with players, the best of whom can be sold off to keep the club afloat. Should Latics suffer relegation it could be one of the cut backs. Much will depend on the ability of Mackay’s current team to avoid relegation. If they can the outlook will be brighter. Attendances and revenue remain inextricably linked, even if not as strongly as they were during the Harry Lyon era.